Well there was a large artichoke as well. Why it should matter what was in the taxi behind her rather than the interview about the award she had just been given, goes part of the way to explain the way my mind works. I guess I saw a story there. Who was the man, where had they been? Had she been writing today? Was she tetchy with the journalist because she wanted to write and not shop? That kind of thing. The Guardian (Friday 12 Oct 07) carries a story which mentions her first words, which most of the initial pieces did not. 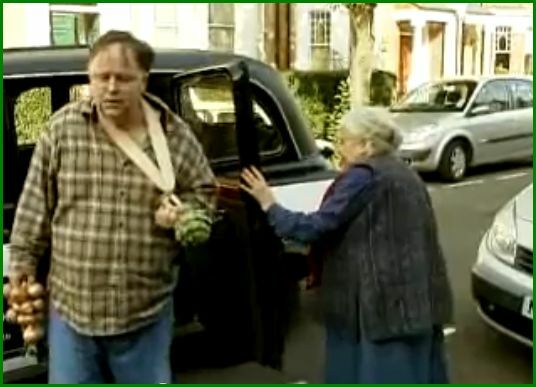 It also embedded an edited version of the TV footage of Doris getting out of her taxi. There, as I was sure I saw the first time, were the two vegetables, or rather, the one artichoke and the net of onions. You see the artichoke first, then as she has just finished saying, Oh, Christ!”, the string of onions and the artichoke in the hands of a bewildered looking man with arm a a sling. I did attend carefully to her response to the news of her award, loving her truculence, but my eyes were on the veg. and wondering who the man was carrying them, who turned out to be not a journalist doing Doris a favour, as was reported elsewhere, but her son Peter, who is not well. Matt Cowan tells us it was him who did the first interview and that it was a member of his crew who opened the cab door. When I met her in London earlier this year she was as perky and feisty as usual, railing against the dumbing down of the book trade and the degenerate taste of readers. Where once her books sold in the tens of thousands, she said, they now sold in dribs and drabs. Two other good pieces on Doris, (sorry not disrespectful, just love the sound of the name) The Sunday Times, today, Grandma has a knuckleduster beside her literary pen, and the New Zealand Dominion Post, wondering what she might say in her acceptance speech, who got the Literature prize before her.